New York : Anchor Books, 1992.
xvii, 396 p. ; 24 cm. 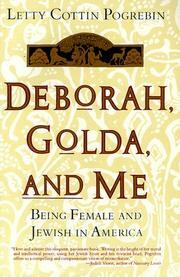 Deborah, Golda, and me : being female and Jewish in America / Letty Cottin Pogrebin. Originally published: New York : Crown, c1991. Includes bibliographical references (p. 379-385) and index. 100 ME:PersonalName 1 $a Personal name Pogrebin, Letty Cottin. $c Statement of responsibility Letty Cottin Pogrebin. 250 Edition $a Edition statement 1st Anchor Books ed. 500 General Note $a General note Originally published: New York : Crown, c1991. 504 BibliogrphyNote $a Bibliography, etc. note Includes bibliographical references (p. 379-385) and index. 600 Subj:Name 10 $a Personal name Pogrebin, Letty Cottin.